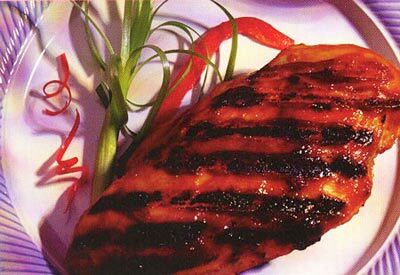 Prepared using low sodium teriyaki sauce. 1. Mix mustard and teriyaki sauce. Reserve 1/3 cup mustard mixture for basting. Add chicken to remaining 1/3 cup mustard mixture; turning to coat well. 2. Cover; marinate in refrigerator for 1 to 2 hours. 3. Remove chicken, discarding marinade. Grill or broil chicken 4 to 6 inches from heat source for 6 minutes on each side or until done, basting frequently with reserved mustard mixture.